My discovery started with a friend’s Facebook post. She was offering her empty coffee canister to anyone who wanted it. Laden with my own collection of containers, I read through responses interested to find a solution for my own unable-to-recycle infant formula cans. One response caught my attention: Treasures4Teachers. Curious, I sought out more information about the organization. The more I learned, the more I wanted to get involved. I wanted to talk with the founder, see the store, and tell others about it. Treasures4Teachers was founded by Barbara Blalock, an energetic and tenacious woman. It had been her dream to start an organization similar to the Resource Area for Teaching when she moved to Arizona and found the educational system without much-needed supplies. 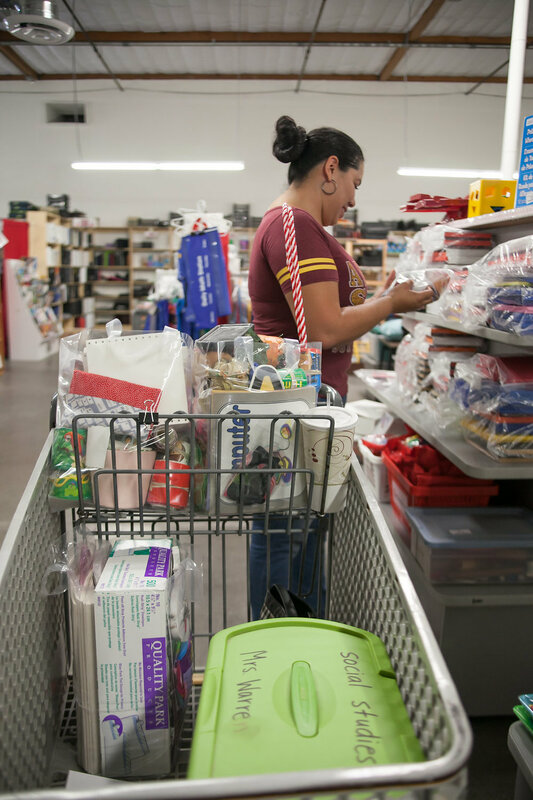 She started collecting items in her garage to distribute to classrooms she worked with but after a six-month battle with valley fever she found herself without a job. After much contemplation, Barbara decided to take the advice of her husband and finally make her dream a reality. In 2005, she started Treasures4Teachers. Treasures4Teachers is a store that provides school supplies to teachers at little or no cost. The store overflows with donations from various businesses and individuals throughout metro Phoenix. At first glance, the store seems to be a collection of unwanted goods – bags full of plastic beans, stacks of dull containers, bins full of scrap canvases, and an additional 12,000 square feet of similar trinkets. Based on the customers’ laden shopping carts that we saw, there are no inexperienced teachers shopping. Supplies from all three sections of the store are in every cart. Books crammed in a clear bag come from the “fill a bag for $5” section. Magazines, egg cartons, and paper towel rolls come from the free section. Packaged items come from the priced-as-marked section. All of these sections are clearly marked while eager volunteers stand close by to offer help. Treasures4Teachers currently has 50 volunteers, with various corporate volunteers helping out during the year. Volunteers help with collecting donations, organizing goods, stocking shelves, creating packets for teachers, and completing data entry. Even with all the help, there is more work that needs to be done. With 3,000 teachers actively shopping at the store, Treasures4Teachers needs more volunteers and donations. School supplies are in high demand and teachers have to dig into their own pockets for basic supplies. “Every year we hear more teachers telling us that they do not have a classroom budget,” Barbara says. “Our goal is to reach those teachers with our resources because in the end, it benefits their students.” The best way to reach those teachers is by sharing what you know. Many of the donations received by Treasures4Teachers are common items in the office or home that many would simply consider throwing away, yet these are the very items Barbara wants to repurpose for the classroom. As passionate as she is about helping teachers, she is equally passionate about reusing and repurposing items. She reports that every year the organization diverts 2.1 million cubic feet of goods from the landfill – enough to fill 16 Olympic-sized swimming pools. The organization is able to reuse about 80% of all the items donated, while recycling the rest. Kelly is a native Arizonian who loves investing in her community as a volunteer with various organizations. She currently resides in Phoenix.